This film was a landmark in Gilbert & Sullivan history, the first time that a complete Savoy Opera was filmed for the silver screen. It was filmed in opulent technicolor, and most video transcriptions available today fail to capture its full glory. The film takes considerable liberties with the libretto; it must be admitted that these would be unacceptable in stage production. For example, the film opens at the Mikado's court, with Nanki-Poo's father telling him that he must marry Katisha within a month or perish ignominiously on the scaffold. Cinematically, this strikes me as correct, since it is always better in the movies to show something happening rather than have a character talk about it after-the-fact. This is a luxury that Gilbert the playwright, who is constrained to set each act in a single time and place, doesn't always have. It is a forgivable liberty, however, as it only makes sense that a film director should take advantage of the medium where doing so enhances the story-telling. This masterpiece is is indispensable. The D'Oyly Carte Opera Company cooperated fully with this production, providing the chorus and two of the company's biggest stars (Green and Granville). Several other principals had D'Oyly Carte credentials, but exactly why they were chosen is unclear. For example, Gregory Stroud had a short stint with the Company in 1926, but his only roles were Grosvenor, Strephon, Florian, Giuseppe. Elizabeth Paynter (Nickell-Lean in her D'Oyly Carte days) was only a minor mezzo, and she had already left the Company when the film was made. Kathleen Naylor (Peep-Bo) also had a rather brief and undistinguished D'Oyly Carte career. Although Gregory Stroud's appearances with the D'Oyly Carte had been limited to playing juvenile baritone roles in the 1926 season, he subsequently had considerable experience touring in the character baritone roles with the J. C. Williamson Gilbert & Sullivan Opera Company in both Australia and New Zealand. Stroud made his début with the company in 1931 and toured in all J.C.W. 's G&S seasons up to 1945 playing the roles of Counsel for the Plaintiff, Sir Marmaduke Pointdextre, Captain Corcoran, Grosvenor, Strephon (and later Earl Mountararat), Florian, Sir Richard Cholmondeley, Guiseppe Palmieri and Pish-Tush. This film is a curious hybrid; it has been neither completely rethought from the then-current D'Oyly Carte production, nor is it a photographed stage play. It falls somewhere in between, and the results were deemed somewhat unsatisfactory by the DOC stalwarts it seems. 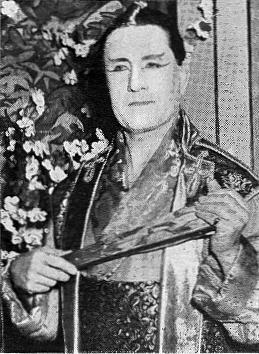 Gregory Stroud as Pish-Tush, pictured during the J. C. Williamson G&S Opera Co.'s 1940 season of The Mikado. He débuted in this role with the company in 1931. 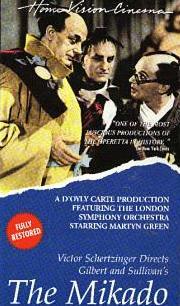 The film's greatest assets IMHO are that it preserves some quite fabulous D'Oyly Carte performances, particularly Martyn Green and Sydney Granville. I also very much like the Pitti-Sing of Elizabeth Nickell-Lean, although she never played the role on stage, having always essayed Peep-Bo with D'Oyly Carte. The film is beautifully designed; the Technicolour is imaginatively used. I especially like that beautiful image of Yum-Yum poking her face out the window while Nanki-Poo serenades her. Most striking! The weaknesses I feel are that Darrell Fancourt does not play the title role, and that ring-ins Kenny Baker and Jean Colin don't bring much to the party, except for box office clout. I don't count the various cuts to be a liability. Though I don't always agree that the right choices were made, it must be remembered that the film was made for a popular market. Operetta was big business in the 1930s. Jeanette MacDonald and Nelson Eddy spearheaded this, and it was not unusual for film studios to buy up the rights to big, expensive shows and 'adapt' them for the movies. Which is to say, they rarely corresponded to their stage counterparts, except in spirit. The Mikado is a case in point. It's big, it's lavish, the singing is fine, and it doesn't tax anyone too much. Like it or not, it's impossible to make a film of Gilbert and Sullivan and stick to the letter of the original without boring the audience. The two act form hampers this. Gilbert works in time frames that are alien to the cinema. The operas are mostly too long and too stagey to hold a cinema audience. G&S is essentially a theatrical experience, not a cinematic one, and what is a virtue on stage can be deadly on film. Rupert D'Oyly Carte no doubt recognised this. Look at the 1966 film to see what I mean; it's a fine record of the company and the opera, and to the G&S buff its fine, but for the greater audience — forget it! I suspect that the 1939 film was a bit of an experiment for D'Oyly Carte — it's debatable whether they intended to film more operas. I suspect not. At any rate, how many of the Savoy Operas would lend themselves to this sort of treatment? I'm curious to know if there were (or are) two different versions issued in the States. I saw the film when I was a young lad in the late 1940s, and I distinctly recall it containing the chorus "We are gentlemen of Japan," which was, in part, visually interpreted by a series of large vases in the Mikado's court, each with semi-Japanese characters forming a face (the faces seeming to be somewhat alive). The video I have omits such a sequence — hence my suspicions of there possibly being two versions. I also don't recall the version I initially viewed as having a Prologue. Then, too, the running time of the video is contrary to the slightly over 90 minutes noted in a variety of sources, including an ancient Universal rental library catalogue. I have the Home Vision VHS video, and there are a number of splices in the pre-print material (or in the very print transferred to tape) that indicate footage excluded and re-inserted. I often wonder if the Prologue was designed for the U.S. market. I certainly don't remember it when I saw it dozens of times on early TV — viewings I distinctly remember having the "We are gentlemen of Japan" opener and semi-animated vase/face montage edited to the song ("on vase and jar, on screen and fan…"). The Little List song was filmed — I saw it in a print shown about 20 years ago at the Museum of Modern Art in New York. There were many missing frames in that version, rendering it barely watchable, but I did see a shot of a Japanese man with a Hitler mustache during "apologetic statesmen." The song was completely cut out of every version I've ever seen on television and every home video version I've examined. The use of a Hitler figure might be the reason for eliminating the number from the film. 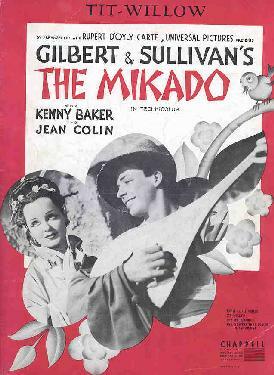 Several years ago, my Mother (still alive) told me that she saw the Mikado film when it was shown on 'general release' at a cinema in Potters Bar where she lived at the time, and that the little list song was included. At the line "that singular anomaly" Green sang "all men who look like this" and produced a picture of Hitler. I thought the cut seemed very abrupt. I simply assumed that it was eliminated from circulating prints because of the "n-word" serenader and perhaps I am right — that is the reason. The possibility that it was eliminated because it might have offended post-WWII Hitler enthusiasts is a deliciously Gilbertian alternative explanation. I have in front of me the programme for the première of this film and can confirm it was 12th January 1939 at The Leicester Square Theatre and was given in aid of the Boy Scouts Appeal Fund in the presence of the then Duke and Duchess of Kent. 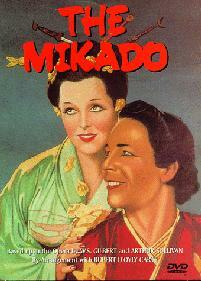 This programme contains "The Story" of the Mikado as filmed. This version contains no reference whatever to the Little List song; that episode being entirely left out in the descriptive story. That to me is conclusive evidence that the item although filmed was never included in the publically shown version, at least in UK. As that number is one of the highlights of the Mikado it would hardly have been overlooked by the storywriter for the programme. There's no question that the number was "censored"; reviewer Frank S. Nugent, writing for The New York Times on June 4, 1939, wrote: "Pressed for an explanation, Universal whispered something about the song's having been censored abroad and arriving here in scarred strips of film: most mysterious." Nugent also complained about the absence of "There's Beauty in the Bellow of the Blast". 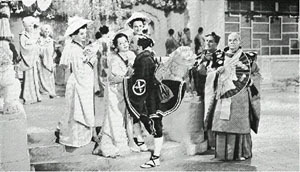 A shot from the film of The Mikado. Ko-Ko (Martyn Green) embraces his bride-to-be, Yum-Yum (Jean Colin) watched by Pitti-Sing (Elizabeth Paynter), Peep-Bo (Kathleen Naylor), Pish-Tush (Gregory Stroud) and Pooh-Bah (Sydney Granville). This is evidently a posed still, as in the actual film Nanki-Poo is standing next to Pooh Bah in this scene, not Pish-Tush. Pitti-Sing was played by Elizabeth Nickell-Lean who used the name Elizabeth Paynter for the film. She had left the company a year before the film was made, having been with them playing small roles since 1931. Her regular role in The Mikado was Peep-Bo, and she does not appear to have played Pitti-Sing on stage at all. From an historical point of view, it would really have been far more preferable for us if she had played Peep-Bo in the film, given the number of years that she played the role on stage, and in view of the fact that she never was a stage Pitti-Sing. Peep-Bo was played by Kathleen Naylor, who had very recently left the company in July 1938. She had been with them since 1933. She joined as a chorister (perhaps understudying roles) and went to play small roles, although she only "inherited" Peep-Bo from Elizabeth Nickell-Lean in 1937 and played this for the one year that she "out-stayed" EN-L.
Perhaps it was because Naylor had been the most recent Peep-Bo that she was given the role over EN-L, or perhaps E-NL got the larger role because she had more experience in general. Pish-Tush was played by Gregory Stroud, who had been a short term principal with the company from December 1926 to the end of that season in July 1927, playing the roles of Grosvenor, Strephon, Florian and Giuseppe. The relevant detail for us is that Stroud was not a stage Pish-Tush. I can't tell you a great deal about Constance Willis (Katisha) or John Barclay (The Mikado) off the top of my head, but I do remember an interesting note stating (without any further references) that Barclay was known for playing in G&S in the States. Jean Colin (Yum-Yum) was known for her work in musical comedy and was already a star in her own right when the film was made. Kenny Baker (Nanki-Poo) had become a star through US radio and had recently been successful in a film. DID YOU KNOW?? Deanna Durbin was on the shortlist to play Yum-Yum. As originally intended, the film employed a unique system allowing encores to be shown according to audience demand — as was done in D'Oyly Carte stage performances of the time. A "placard" would be displayed at the start of the film saying that if applause warranted it, certain pieces would be encored. Depending on the projectionist's judgement, the main projector would be shut off and an auxiliary projector simultaneously turned on, showing the encore(s). This contrivance does not seem to have been uniformly popular, but it did not stop the studio from applying for a patent! 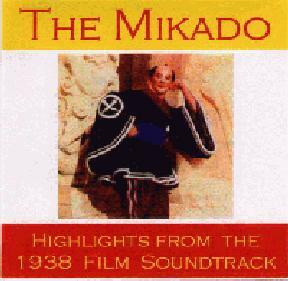 The new Image Entertainment DVD of the 1939 film of The Mikado is a much better transfer than the VHS tape that I obtained from Opera World a few years ago. The DVD appears to have been dubbed from a considerably better-preserved source than the VHS and doesn't contain the butchered splices that so mar the latter. The DVD sound is somewhat better as well, particularly with respect to reducing (though not entirely eliminating) flutter due to rapid fluctuation in speed, but I suspect that more could have been done to remove some of the raucous quality and random mechanical noises. I noticed a difference between the DVD and VHS versions during "My object all sublime." The VHS has a chorus of nobles that sing "Yes" after the Mikado lists each punishment. The DVD has the same video footage as the VHS of the nobles singing but omits the sung "Yes," which makes it look very odd on the DVD with the nobles mouthing "yes" but no sound coming out. I also noticed that Chris Webster's sound track CD version [below] also lacks the repeated "Yes." Chris Webster brought me round a copy of a test pressing of the CD he has been preparing, details of which he has posted to the net. I had to sit down and listen to it, and thought he has done an excellent job. It proved to be absolutely fascinating to listen to the sound without the distraction of looking at the film at the same time, and I can strongly recommend it. One of the most interesting things was to hear how much more animated Martyn Green and Sydney Granville are on the sound track than they are on their gramophone records (which sound boring by comparison) and how often they as well as the rest of the cast half-speak lines rather than singing them — again in sharp contrast to the records. I noted also how melodramatic Sydney Granville's dialogue sounds, very different from present day delivery. Listeners will probably find Kenny Baker's Nanki-Poo a misjudgement. He sings beautifully (albeit with an American accent), but his acting is atrocious. One gets the impression that he simply did not understand the humor at all. However, for the performances of Green and Granville alone, the CD is a delight. Though not properly within the scope of this site, Chris Webster thought that readers would be interested to know that two of Kenny Baker's songs from the film, "The moon and I" and "A wand'ring minstrel," were released on 78rpm records. Though described as "from the film," these were studio recordings conducted by one Nat W. Finston. The 78rpm release was HMV BD 741, published between June and December, 1939. There was an EP release, HMV 7EG 8089, with the two G&S selections on one side, and unrelated material on the other side. The two songs are also on a recent Kenny Baker retrospective CD, AJA CD 5251.